Why do mobile users add things to shopping carts and then not purchase those items? It’s a vexing problem faced by merchants, made even more prominent by the meteoric rise of mobile e-commerce. 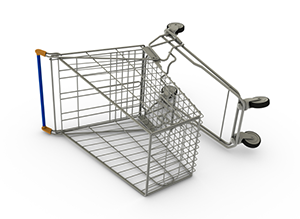 Shopping cart abandonment on websites has been examined for more than a decade, but most research shows that nearly 70% of web shoppers still abandon their carts, and on mobile devices, it's above 90%! These reasons for not completing the purchase process are logical; things only get interesting when we consider how much the actual process of shopping has changed in the digital age. Now, more than ever, all purchasing behavior begins with the user. A user’s core purchasing drivers, based largely on life experiences, desires and personalities, are filtered through externalities and turned into behaviors that can affect any part of the purchasing process. Technological innovation has exposed markets to widespread fragmentation and merchants are losing control of the sales funnel in an era of mass customization. The result is that there are multiple stages of the buying decision that, for most users, take place within the “shopping cart” flow. Digital shopping cart behavior is thus a more fluid phase in purchasing than in a traditional, physical shopping cart or even in early e-commerce websites. In the mobile environment, where purchase behavior is geographically dynamic, it is even more difficult to strictly measure shopping cart abandonment data by attaching it to a particular point of the purchasing process. Merchants should examine and assess the purchasing process and potential buyers from a holistic perspective. This kind of sophisticated approach requires not only data-based observations, but also attempting to acknowledge and illuminate the core purchasing drivers that exist in every user. The resulting contextual observations allow more customized, effective communications with users. Consider that in the past, server-client technology was driven by “dumb” appliances: dumb terminals, dumb routers, dumb pipes, etc. But advances in data acquisition and storage have made ubiquitous analysis available on a scale never imagined. This development presents an enormous opportunity to derive not only data insights, but to apply those insights in a contextual manner. Unfortunately, most mobile and portals are reactionary and treat all users exactly the same, a mere net to either capture browsers in the act of purchasing or to prevent visitors from escaping. Knowledge of users is not applied discretely, and virtually none of the experience is customized. This is a lost opportunity to not only nurture relationships with consumers, but also in sales. A few merchants are smart, or getting smarter. Amazon, for example, often customizes the browsing experience based on past purchases, browsing, and similar items. Some merchants use transactional information to generate purchasing recommendations. Some merchants note previous visits and acknowledge their users. A rare group of merchants even allows preferences to customize each visit on the surface level. But almost no merchants at all are leveraging the vast amounts of user/visitor/customer knowledge available into a truly personal user experience. This lack of action is both a surprise and an opportunity. For example, the level of behavioral data available to most merchants is stunning: preferences data, Facebook’s open graph, LinkedIn data, Twitter feeds, etc. Advertisers use algorithms based on this and similar data to serve incredibly prescient advertising, but the same brains aren’t being applied to the rest of the digital experience. The result is a homogenous, reactive experience for most users, and it forms the core of shopping cart abandonment. We created the following whitepaper: http://mypref.co/107aa2s based on our research that delves into the reasons for shopping cart abandoment and provides guidance on addressing it. In the coming weeks, we will share some tangible solutions you can use to address this problem from your consumer’s perspective.